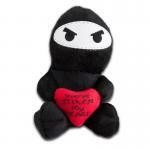 Nothing is more romantic than a ninja and the Plush Heart Ninja enhances the romance by being a stuffed toy. 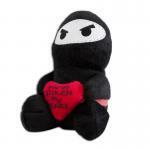 Sure, there's always the cliché of the Valentine's Day stuffed animals. 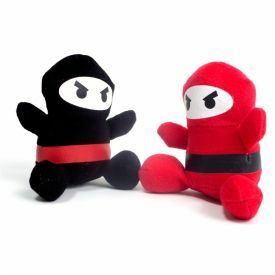 But if you have a boyfriend who loves martial arts or ninjutsu, this plush ninja is the the perfect Valentine gift for him. 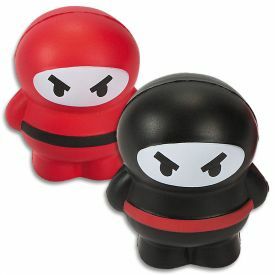 This romantic gift is six inches long and black. The Valentine's plush ninja is sitting down and holding a red heart that says "you've stolen my heart" (this is a play on words, since ninjas are known as assassins and thieves). Avoid the crowded malls and long lines just to get your loved one a Valentine's Day stuffed animal. 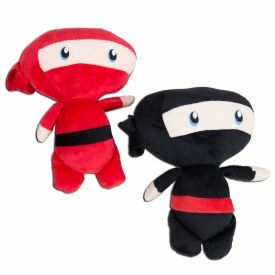 Get one of these ninja plushies and show him or her how you really feel. Holding Heart that Says "you've stolen my heart"